The Soviet army's seventh and most punishing assault on Afghanistan's Panjshir Valley this spring was in many respects an exercise in frustration. Moscow was determined to bring down Ahmad Shah Massoud, 30, a resourceful leader of the mujahedin, who have been defying the Soviets ever since they invaded the country in 1979. But only five days before the beginning of the Soviet operation, code-named Goodbye Massoud, the mujahedin commander suddenly slipped away from his headquarters and went into hiding. The following week the Soviets claimed Massoud was dead. Within hours, the rebel leader's voice crackled over the Soviet army's secret radio network, accurately describing the weather, the Soviet positions and their casualties that day. Meanwhile, in whatever direction Soviet tanks turned, they ran across rebel-laid land mines. According to Western diplomats in the Afghan capital of Kabul, casualties were so high that gravediggers at the local cemetery worked overtime to bury up to 40 soldiers a day. Three weeks before the Soviet tanks began to roll, American spy satellites detected movements that allowed agents to warn the rebels of the impending attack. Massoud's radio performance was made possible by the use of more than 40 CIA-supplied portable transmitters. In response to a specific request from Massoud, the CIA also arranged to send hundreds of land mines by plane, ship, truck, camel and pony across three continents and through several intermediaries, so that they got into rebel hands just before Goodbye Massoud began. The thwarting of Goodbye Massoud was the most recent, and perhaps the most daring, success of the CIA's operation to assist the embattled guerrillas. The mujahedin had some special help that enabled them to resist the formidable assault so well. Three weeks before the Soviet tanks began to roll, American spy satellites detected movements that allowed agents to warn the rebels of the impending attack. Massoud's radio performance was made possible by the use of more than 40 CIA-supplied portable transmitters. In response to a specific request from Massoud, the CIA also arranged to send hundreds of land mines by plane, ship, truck, camel and pony across three continents and through several intermediaries, so that they got into rebel hands just before Goodbye Massoud began. Says a Western diplomat: "Nothing would make the Soviets happier than breaking the back of the CIA pipeline in Afghanistan." The thwarting of Goodbye Massoud was the most recent, and perhaps the most daring, success of the CIA's operation to assist the embattled guerrillas. Like most of the world, the U.S. was outraged when the Soviets invaded Afghanistan and proceeded to transform it into a puppet state. That shock, together with widespread sympathy for the mujahedin, has not abated as Moscow has tried to consolidate its tenuous control over the nation by resorting to carpet bombing, chemical warfare and outright massacre of civilians. So the existence of a CIA pipeline to the mujahedin has long been an open secret. President Carter's National Security Adviser, Zbigniew Brzezinski, publicly took credit for setting up the arms flow to the Afghan rebels in 1979. Shortly before his death in 1981, Egyptian President Anwar Sadat acknowledged that the U.S. was using Egypt to ship weapons to Afghanistan. During a visit to Pakistan last year, Secretary of State George Shultz went so far as to tell several thousand Afghan refugees, "You fight valiantly, and your spirit inspires the world. I want you to know that you do not fight alone. I can assure you that the United States has, does and will continue to stand with you." Sources in Asia, the Middle East and the U.S. have given TIME some details of how the aid pipeline works. Used selectively, the information sheds light on this operation without exposing individuals and organizations. The CIA spends around $75 million a year supplying the rebels with grenades, RPG-7 rocket launchers and portable surface-to-air missiles, as well as with radio equipment and medicines. Although the guerrillas have their own stock of rifles, which they replenish with weapons captured during ambushes or taken from the Soviet dead, the CIA sends ammunition for AK-47s, together with machine guns and sophisticated snipers' rifles. Shipments of these goods arrive every few days, sometimes in the arms of messengers, but most often on caravans that travel on moonless nights to evade the powerful searchlights of low-flying Soviet helicopters. As a senior Western military attache told TIME, "Getting the material they need in to the mujahedin must be one of the most hazardous and difficult supply tasks ever undertaken in modern military history." 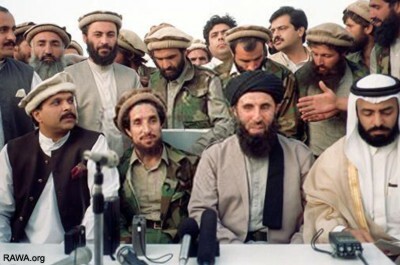 Massoud (2nd from left) signing agreement with Gulbuddin Hekmatyar, the most wanted criminal in Afghanistan, in presence of their Pakistani and Arab masters. Politically the CIA's main challenge has been to avoid Unking its operation to the government of Pakistani President Zia ul-Haq. Burdened by the inflow of more than 3 million Afghan refugees, Zia has actively tried to negotiate a settlement to the war in the face of Soviet intransigence. He has also repeatedly denied Soviet charges that his country was directly supplying the Afghan rebels in any way. Evidence to the contrary would not only compromise the talks, which are being conducted through the United Nations, but could even give the Soviets a pretext for moving into Pakistan's North-West Frontier province. "We're going to keep Zia's hands clean," CIA Director William Casey told a top aide early on. Says a senior intelligence official: "Ideally, the pipeline had to be invisible, passing through Pakistan without the Pakistanis' being aware that it was there." As a result, much of the operation is handled with the help of Saudi Arabia, which grows increasingly alarmed as Soviet airbases draw ever closer to its oilfields. The Saudis' support for the guerrillas is by no means covert; only six weeks ago, Crown Prince Abdullah encouragingly assured Afghan refugees in Pakistan, "Your struggle is a jihad [holy war] because you have taken up arms in defense of Islam. We will continue to assist you as we did in the past. We will always remain on your side." The CIA pipeline to the guerrillas, initiated by the Carter Administration, was stepped up by Casey soon after President Reagan's election. The new director wasted no time in ordering his station chiefs in Europe to look for Afghan exiles who might make good recruits. The CIA men began by poring over lists of students and teachers, compiling dossiers on likely candidates and placing them under surveillance. Those who seemed thoroughly reliable and unquestionably pro-mujahedin received casual invitations to lunch from a visiting American professor, or a priest, perhaps, or even a Saudi businessman. All were undercover CIA agents. While the CIA was recruiting some 50 such Afghans in Europe, it was also, with help from the FBI, gathering a similar group in the U.S. Though most of the recruits were students, one was a Manhattan taxi driver, another a millworker from Ohio, a third a judo instructor from the Southwest. For nine months, the 100 Afghans underwent training at CIA schools around the U.S., where they learned about shipping, running travel agencies and sending large containers overseas. At last, in the spring of 1982, Casey sent his fresh graduates into the field, armed with code names, passports and generous subsidies. Some 30 Afghan agents took up positions in Saudi Arabia, working for small companies that handled the shipment of cargo to Asia. There they were put in charge of sending out electronic equipment, sewing machines and fertilizers, as well as religious materials going to far-flung Muslims in Malaysia, Indonesia and, of course, Pakistan. To these regular shipments, the Afghans would sometimes add a few cases of arms, specially coded for quick detection by their colleagues. "We began modestly, because we were new to the game," one recruit says. "But as we got the hang of it, we were gradually able to increase the volume." In 1990 the CIA's secret relationship with Massoud soured because of a dispute over a $500,000 payment. Gary Schroen, a CIA officer then working from Islamabad, Pakistan, had delivered the cash to Massoud's brother in exchange for assurances that Massoud would attack Afghan communist forces along a key artery, the Salang Highway. But Massoud's forces never moved, so far as the CIA could tell. Schroen and other officers believed they had been ripped off for half a million dollars. Meanwhile, the majority of the Afghan recruits went to Pakistan, where the CIA has for three decades run a topnotch network of agents and safe houses. "The CIA archives on Pakistan are perhaps the best in the world," a Western diplomat notes. "When the CIA pipeline first moved in, there wasn't a path into or out of Afghanistan that they didn't have mapped down to every physical detail." Better yet, nearly half of the almost 5,000 ships that unloaded goods in the Pakistani port of Karachi last year were carrying cargo from the Persian Gulf. A special arrangement allows vessels transporting food or medicine for Afghan refugees in Pakistan to be unloaded quickly and waved onto waiting trucks without going through normal customs procedures. The Afghans probably make use of this system to send along their arms. Afghanistan fight the Russians." As soon as Massoud requested the mines, U.S. Army ordnance depots in the U.S. and West Germany collected the matériel, erased all the U.S. markings, then sent it to a CIA installation near Stuttgart. There the mines were wrapped in special shock-absorbent material and packed in lightweight, waterproof, steel shipping boxes. The crates were stuffed with telephone wires and batteries; their contents were described as telephone equipment for a religious organization. Next the shipment was loaded onto a cargo plane, which a CIA crew flew to a secret landing strip in the Persian Gulf sultanate of Oman. From there the mines were trans ported by ship to Pakistan's Makran coast. The CIA Afghans met the arms there and drove them to a rendezvous with the mujahedin in a desolate area near the Afghan border. The guerrillas took the arms away in a Soviet-made truck; when that vehicle broke down, they switched to camels. Upon arrival at the outskirts of Kabul, the mujahedin opened the boxes and carefully packed each mine in a mixture of camel dung, mud and straw—the mate rials that local peasants use to build walls. Finally, more than two weeks later, ponies piled high with the booty arrived at Massoud's base in the Panjshir Valley. Says a senior Western diplomat in the region: "Considering that we are living in the age of computers and the Concorde, the means of getting help to the mujahedin are extremely primitive. A series of clandestine CIA teams carrying electronic intercept equipment and relatively small amounts of cash -- up to $250,000 per visit -- began to visit Massoud in the Panjshir Valley. The first formal group, code-named NALT-1, flew on one of Massoud's helicopters from Dushanbe to the Panjshir Valley late in 1997. Airdrops are possible in rare circumstances, but the Soviets have radar and fast interceptors." The CIA has also taken care to set up swift and secure communication links with and among the rebels. Upon receiving intelligence, intermediaries in Oman and Saudi Arabia relay messages east ward to Afghan agents in Pakistan and westward to CIA headquarters in Langley, Va. Two years ago, the six major guerrilla group within Afghanistan had to communicate by messenger; during the latest Soviet assault, Massoud was able to use radios to call for assistance from two other rebel bands. The pipeline is probably working at close to its capacity, and the CIA is determined not to upset its delicate sys tem. For that reason, the agency has, in recent months, refused to increase the quality or quantity of U.S. aid to the Afghan rebels. Last month, however, the House of Representatives passed a bill that would make Pakistan one of five countries where more than six military advisers may be stationed. Sums up an Afghan agent: "Soviet at tempts to cut the pipeline have created some frustration and disappointment. But the struggle inside Afghanistan continues to survive and, in some important ways, the pipeline continues to grow." Is Ahmad Shah Masood a legitimate candidate for the Nobel Peace Prize?